I have reflected a lot lately about this blog and life in general. My little blog is not so little anymore, and now at it’s two-year anniversary it’s attracting around 50,000 views a month (more than I ever dreamed possible!). When I started it was to compliment my Etsy shop and share my creations with a couple of followers. The 2013 version of me needed a bit of a creative outlet too, with Little Lady just turning 2 at the time. 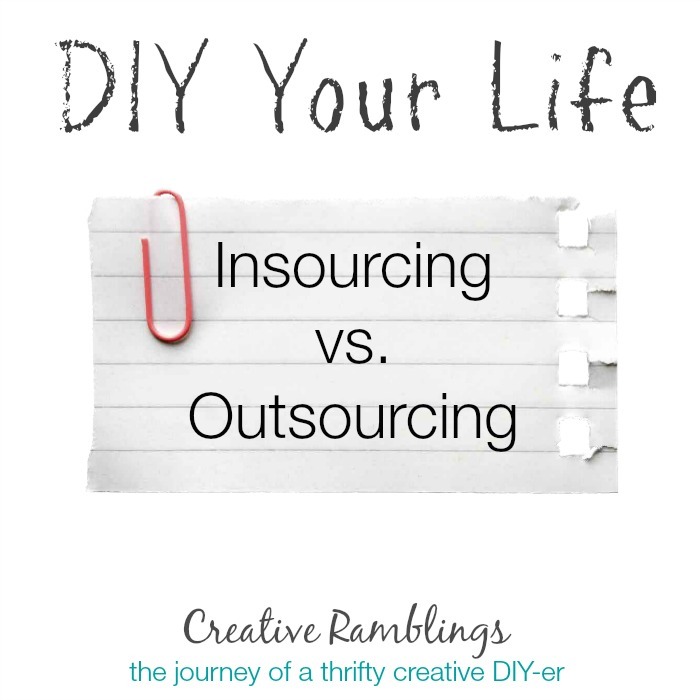 This blog is, at its core, the journey of a thrifty creative DIY-er. This year I want to expand on that a bit and share with you the FINANCIAL journey of this thrifty creative DIY-er. I have been and still am more than a little frustrated with the prevalent theme in society of outsourcing most aspects of life. I am (or at least was) as guilty as anyone else. Just a few years ago I found myself busy with an infant and part of a dual income household. Life was chaotic. I woke up one morning and realized we had done what society had taught us to do in such a situation. We outsourced nearly everything because we thought we had to in order to make time for ourselves and fit everything in. We were cleaning our home with a maid service, using day care during work hours, and eating many of our meals at restaurants. When I took a step back I realized that this was not the right path for us. We didn’t need to be running ourselves this ragged. Since then I have been on a slow but steady journey to becoming less dependent on others and to develop my own life skills versus outsourcing them. This blog’s theme of a thrifty creative journey encompasses some of this showcasing my home DIY projects that have saved us money. My journey is still in its infancy but my family has already seen major benefits from insourcing rather than outsourcing life’s tasks. So where do you, my lovely readers, and I go from here? This blog will continue with my best attempts at crafty projects, that will not change. I will not slack on the quality or quantity of my core content. I truly enjoy creating and love the DIY community. I do plan to occasionally post about the other ways I am adapting my life skills to be more independent and stop outsourcing. I hope it will inspire you, but I also hope it keeps me diligent and on the right path. I hope you will continue this thrifty creative journey with me as I attempt to DIY my life. A couple posts you may enjoy. Can your family live on one income? Let’s stay in touch, as I share my journey I want to hear about yours too. You are a crafty bunch, how do you use your creativity in other parts of your life. First, wow! That is a lot of folks following! Congratulations! And, I hope I am that successful. Good luck on your journey. I would keep the maid though. Lol! Congratulations on the success of Creative Ramblings. I have loved reading and seeing all your projects. I can’t wait to see how you insource more? I’m all for keeping things simple and at home. Thank you so much. A simple life is sometimes the happiest! That’s great you are taking it all on your own! I personally hate cleaning our house so I am pretty happy to outsource that aspect of my life. ha Congrats on the growth of your blog! Many moons ago, I stepped back from my legal career to be a full time mommy. It was a tough decision but one I have never regretted. Only you can be the mommy to your kids during this season of life. Other things can wait, but kids grow so quickly. May your journey be blessed! Thank you so much Christine for sharing. I remember my friend getting into a Twitter argument with someone who said SAHM’s were lazy. Amazingly it’s ok to pay someone to watch your children, but watching them yourself is lazy. No, I would like a maid service to come through once a quarter for the deep cleaning, but otherwise, I like keeping my house for my family. I really miss having someone clean my house, it was so so nice to come home to a clean place. But I don’t miss the price. Thanks for sharing and for reading.